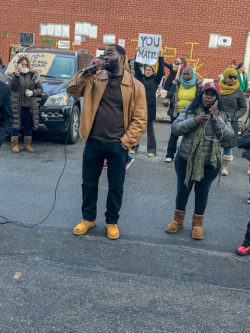 Protesters at the Metropolitan Detention Center held up a sign letting inmates know that they were heard and that they weren’t leaving until the heat, hot water and electricity was restored. 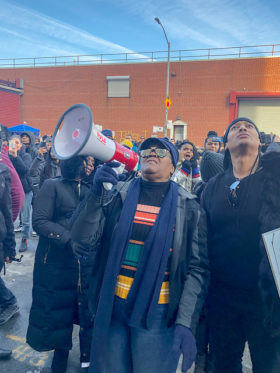 Power was restored at the Metropolitan Detention Center in Sunset Park, Brooklyn yesterday, but not before desperate family members tried to push their way past guards and into the front door, and were pepper sprayed by correctional officers. Over 1,600 inmates have been subjected to inhumane conditions for a week as the center partially lost power. Inmates have been living with no heat, hot water, showers, few meals and were being detained in blackout conditions after a power grid failed for a week. About 200 family members and protestors have held a vigil in front of MDC for four days. 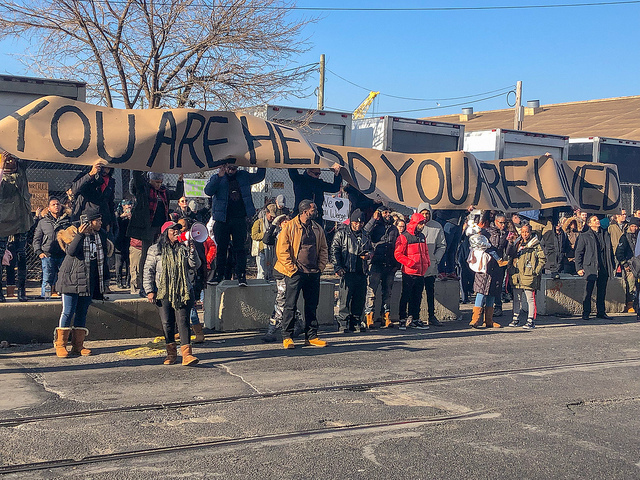 They marched, and shouted ““No heat, no peace,” they held signs that said, “You are loved.” Inmates communicated with family members and protestors by banging on the glass and flickering flashlights. ctivists, protesters and families were relieved when they finally saw inmates turning on and off their room lights. New York Attorney General Letitia James who toured the facility on Sunday morning told them that everything would be operational by Monday. But with pressure raising, prison officials, contractors and ConED had the building up and running late Sunday night. Murchison said she hadn’t heard from her son in days and she just wanted to see him any way she could. She said guards saw people coming in and met them with aggression. The guards used pepper spray to turn back those hoping to enter the building. Before power was restored, protesters held signs that quoted the 8th Amendment, provides protection from cruel and unusual punishments. Many of the inmates at the prison are serving short sentences for minor offenses or are simply waiting to go to trial. Many on hand questioned the urgency and the humane aspect of having people freezing in a federal-run building. Even with the lights returned, Roy Waterman, who spent a few months at the facility in 2008, remained skeptical. He said that the heating system was not equipped to heat the entire building if temperatures dropped below freezing.